Tribune Chronicle / Joe Simon Newton Falls’ Tara Backherms watches a deep fly ball to left field during Wednesday’s game against Brookfield. The Warriors beat the Tigers, 6-5. NEWTON FALLS — With the game on the line and things suddenly unraveling for Brookfield, first-year Warriors coach David DeJoy wasn’t sure what to expect. Just eight games into his first season, DeJoy is still figuring out what kind of team he inherited. He found out a lot Wednesday. The Warriors held on for a 6-5 victory in a back-and-forth All-American Conference, Blue Tier battle with Newton Falls, a team that run-ruled them just two days earlier. Tribune Chronicle / Joe Simon Brookfield’s Gabby Schiska delivers a pitch to a Newton Falls’ batter during Wednesday’s game. The game was a pitchers’ duel for five innings, but Brookfield (3-5, 1-5) put together a four-run sixth inning to take a 5-2 lead. Bailey Drapola then crushed a solo home run — her fourth of the year — to make it 6-2 going into the bottom of the seventh inning. Newton Falls (3-4, 1-3) wasn’t ready to lay down. 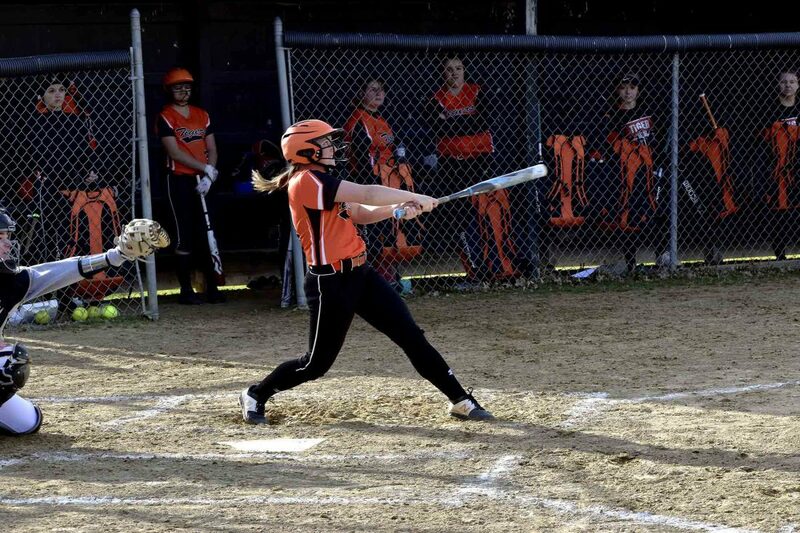 A single and a hit by pitch were sandwiched between a strikeout, and freshman Emily Knight struck some fear into Brookfield with a three-run shot that just cleared the left-field fence. That made the score, 6-5, and put some doubt into the minds of the Warriors. 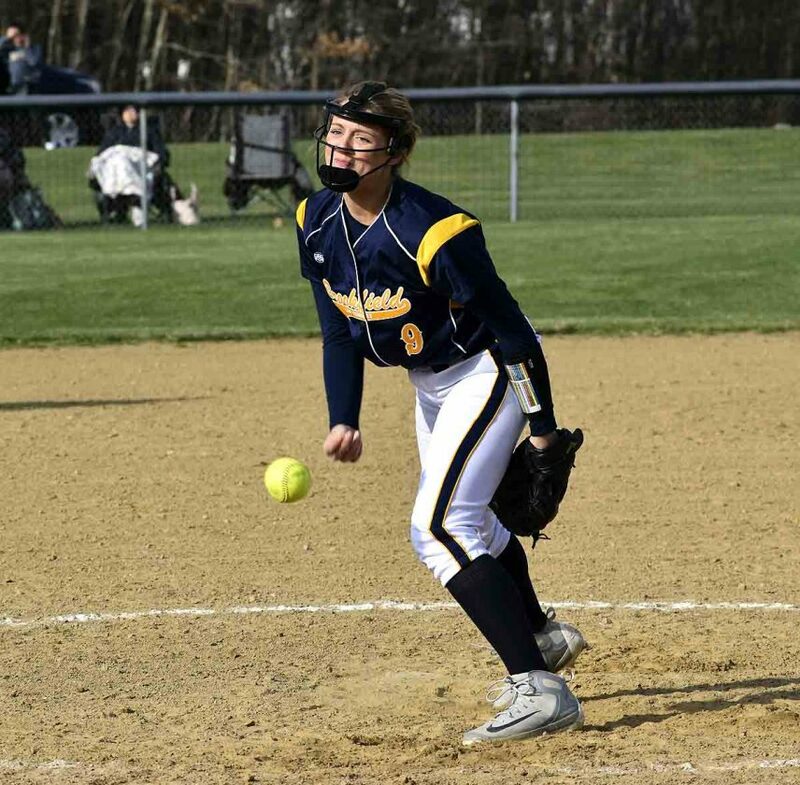 Warriors pitcher Gabby Schiska scooped up a slow roller by the No. 3 hitter and fired it to first for the second out, and she then struck out the clean-up hitter to end the game. Schiska rebounded from a tough outing against the Tigers on Monday, twirling a complete game and allowing six hits. She struck out four and didn’t walk a batter. Drapola, the Warriors shortstop, had an uncharacteristically bad day in the field with three errors. 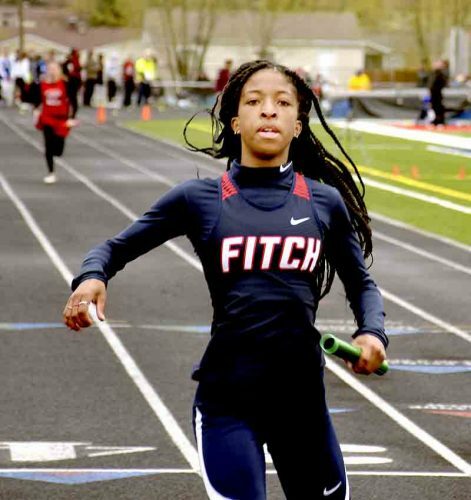 The University of Akron recruit made up for it with her bat though. She was a triple shy of the cycle, with a single, a double, a home run and two runs scored. Her solo blast to right-center field in the sixth ended up being the difference. McNamara did plenty of damage at the plate, too. The senior finished 2-for-3 and smacked a two-run single down the left-field line in the four-run sixth inning. Autumn Sirochman also had a two-run base hit in the inning. Overall, the Warriors had five of their 10 hits in the sixth and all nine hitters came to the plate. Both teams have endured tough starts to the season. Each played Champion, the back-to-back Division III state champion, twice in the early going. The Tigers also lost to unbeaten Ursuline, while Brookfield dropped two close games to Crestview. Newton Falls starts five freshmen, so Pelyak understands there are going to be ups and downs during the season. Both teams are learning as they go in 2019.